Anritsu Company and ETS-Lindgren announced the Anritsu MT8820C RF Tester has been selected by ETS-Lindgren as an approved test solution for 2G to 4G/LTE/MIMO Over-the-Air (OTA) testing. As part of the selection, support for the MT8820C has been integrated into the CTIA-compliant ETS-Lindgren EMQuest™ EMQ-100 Antenna Measurement Software. Currently available to user equipment (UE) developers and manufacturers, it is an accurate and flexible turnkey solution to characterize and validate designs in accordance with industry standards. The MT8820C and EMQuest EMQ-100 provide a comprehensive solution that can test devices based on various wireless technologies. Specialized calibration and validation methods are supported for MIMO OTA testing and other analysis, including TRP/TIS. The MT8820C RF Tester is a multi-format 2G, 3G, and 4G/LTE/MIMO instrument with the capability for wireless device calibration, RF parametric testing and functional testing (including call processing or no-call based testing). The MT8820C currently supports LTE (FDD and TDD), W-CDMA/HSPA to DC-HSDPA, CDMA2K to single and multi-carrier 1xEV-DO rel. A, GSM/(E)-GPRS and TD-SCDMA/HSPA. Through Anritsu’s unique ParallelPhone Mode (PPM™) technology, combinations of these technologies may also be supported, including SV-LTE, SVDO, CSFB and redirection. PPM also enables testing of technologies that require two simultaneous RFs, including DC-HSDPA and LTE 2x2 MIMO in a single unit. 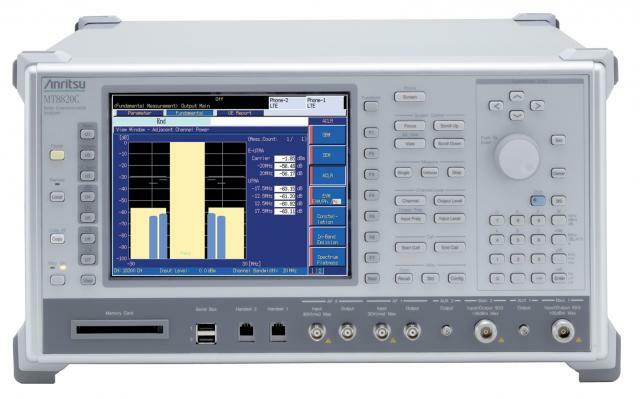 ETS-Lindgren’s EMQuest EMQ-100 offers a wide range of fully parameterized test methods for measuring basic antenna performance metrics, as well as testing both radiated and conducted performance of various wireless devices. Flexible in its design, the EMQuest EMQ-100 can be used to analyze antennas in stand-alone applications, or to test an embedded antenna system and radio module against any of the industry standard OTA radiated performance test requirements. Anritsu Company is the American subsidiary of Anritsu Corporation, a global provider of innovative communications test and measurement solutions for more than 110 years. Anritsu provides solutions for existing and next-generation wired and wireless communication systems and operations. Anritsu products include wireless, optical, microwave/RF, and digital instruments, as well as operations support systems for R&D, manufacturing, installation, and maintenance. Anritsu also provides precision microwave/RF components, optical devices, and high-speed electrical devices for communication products and systems. With offices throughout the world, Anritsu sells in over 90 countries with approximately 4,000 employees.